UN maps show damaged buildings in Gaza - but that's only half the picture, as IDF exposes in an informative new video. An informative new video posted to YouTube on Monday by the IDF shows how the damage in Gaza reported by the UN is only giving half of the picture, and skewing the facts on the ground. In the video maps published by the UN showing Gaza buildings damaged in Operation Protective Edge are represented by red dots. However, the video goes on to clarify how these buildings - which include private homes, hospitals and schools - are being used to launch rockets and attacks from terror tunnels. The video corroborates an IDF report which was declassified last Tuesday, and which details how Hamas embeds itself in the civilian infrastructure of Gaza to launch terror attacks on Israel. 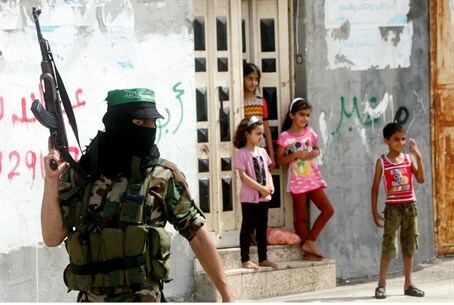 According to the report, during the course of its recent terror war on Israel, Hamas has fired over 1,600 rockets from civilian sites, cynically using UN facilities, schools, graveyards, mosques and power plants, among others. Numerous IDF soldiers have reported on the rampant use of human shields and its damaging effect on the army's operational ability. The commander of the IAF special reconnaissance Flying Camel Squadron likewise said recently that aborting airstrikes due to Hamas's tactics of embedding among civilians "sabotages" the operation. In context of the difficulties posed by Hamas's warfare, Barak Seener, an Associate fellow at Britain's Royal United Services Institute for Defense and Security Studies, told Arutz Sheva on Monday that Israel is "choosing not to win" in Gaza. According to the British expert, Israel should have gone in harder and quicker, should reclassify human shields as enemy combatants and stop aborting airstrikes, noting Israel "should not subject itself to norms and procedures that no military of any western liberal democracy would ever consider."